Every once in a while, I get sucked into these debates about the best brewery in the province, or the country, or the world, but really, it comes down to individual products and personal tastes. It's tough to put a brewery above all others when so many make delicious beers, but I can easily compare two IPAs or two dry-hopped kettle sours, or two business models. I've heard Brasserie Dunham ranked in the tops of the province or the country many times, but that all depends on the criteria we use to assess them. They, deservedly and once again, made ratebeer's list of the world's top 100 breweries for 2016. But where they rank specifically is so subjective. Regardless, that success is certainly merited! 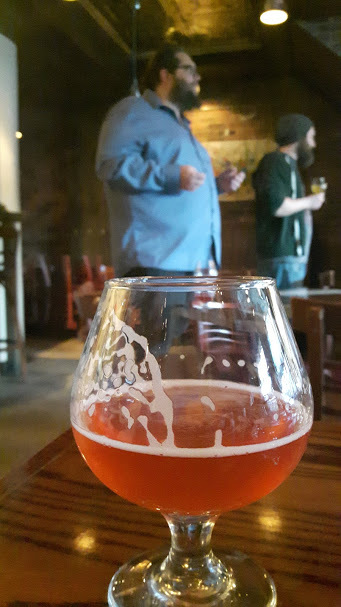 One thing is for certain to me though: Dunham leads the (Canadian) charge in thoughtful experimentation driving forward the beer scene for all of us, bringing up those influenced by them rather than simply competing against them. The innovations brought by founder Sébastien Gagnon, brewmaster Eloi Deit, and sommelier Simon Gaudreault don't always result in success (though they usually do), but they always inspire, advance, and propel the ideas of what beer is and can be! How you may ask? Well, it starts with their forward-thinking blogger/beer media scene invite to taste their products ahead of their pending May 13 Bottle Release Party (details here and here), and it continues with their ticketed, lineup-reduced, well planned release events, but it carries forward mostly into their beers, often weaving mixed fermentations, barrel-aging, fruit, blends, and funk. What's not to like? I'll leave you to read through the specifics of the beers on the order page, aside from what I add below, but we were able to grab a sneak peak of 7 beers (6 from the release and one other) and I offer some preview thoughts below. Note that despite the invite, I will critique where I feel criticism is needed and, indeed, Simon asks me to do so as he insists their invite is partially for such reflection and not simply to demand unwarranted praise. Most of them! I also enjoyed the latest incarnation of Cyclope Dzeta (pictured above) and Ask For Paul (brewed for the Toronto Comic Arts Festival), but these beers are not a part of the release and so won't be thoroughly reviewed here. 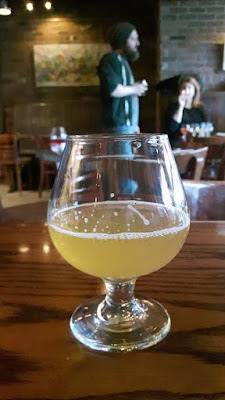 This 5.6% ABV Saison is the first in a series of local (semi-)collaborations in which Brasserie Dunham will showcase local wine grapes, through a process of cold fermentation with the must before a lengthy (in this case 5.5 month) barrel-aging process before brett re-fermentation (in this case with four different brett strains plus whatever existed on the grape skins to begin with). Though the plan is to showcase grapes and barrels from the same wineries, it was impossible this time, though the grapes here are of the Vidal variety (often used for ice wines) from L'Orpailleur (one of Quebec's earliest wineries). The base beer here is Dunham's classic Saison Rustique, but that won't be obvious to any but the most seasoned imbiber as this beer has transformed majestically. The nose is boldly aromatic wafting an exhilarating complement of vinous notes, wood, and that funky bretted white wine character that is unique and difficult to describe but which simply shines when wild yeast, barrels, and white wine are allowed to coalesce in a funky beer. There is a fermenting fruit quality to it, though it also has more than a passing resemblance to the nose of Assemblage 1: Sauternes. Perhaps there is something about these sweeter grapes providing a specific sugar for the brett, but whatever it is, it smells seductively enticing! Perhaps, to be even more precise, it presents what I am starting to understand to be Dunham's classic signature funk, and the development of such a complex signature is a sign of maturity from this relatively young brewery. Up front the taste brings a moderately tannic but quite musty and fruity white wine character. Though inviting up front, I find it gets fairly muted and non-descript with a lightly watery finish that is a slight let-down after the nose. There is a faint linger. It is supported by a medium body, but feels lighter due to fairly low carbonation and the mild flavour-finish. Don't get me wrong, this isn't problematically low carbonated or entirely bland, however, Simon assures me it should both funk up and continue to carbonate as our bottles were extremely fresh. Minor critiques aside, this beer is unique, innovative, aromatic, and tasty, while delicate and nuanced, not to mention that it embodies a spirit of collaboration in showcasing local wineries. It is precisely the model of Dunham innovation that I adore, even if I think the execution here is merely good and not yet perfected. I remain as excited for the evolution of this specific beer, as I do to the evolution of this line. Despite being called a grisette, with a saison base and at nearly 6% (5.8) ABV, this might better be called a saison. It does, however, drink easily as if lighter. 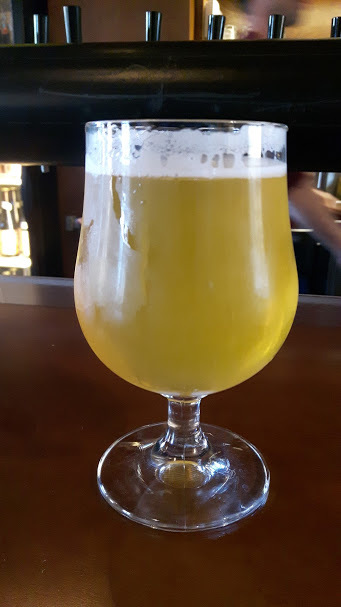 Based on a grisette/saison brewed in collaboration with Le Cheval Blanc for their 30th Anniversary, this beer evolves with weizen yeast pitched after two days of primary fermentation, with the addition of Sea Buckthorn, and with aging in white wine barrels. And, WOW, is it wonderfully aromatic! The nose presents an enticing bouquet that dominates the first flight (Ask For Paul, Viti Vini Vici, and this were presented first). It expresses notes of funky wet wood, with some floral esters, and a tannin-forward vinousness. Oddly, though the nose here is the boldest of the three at the pour, it becomes the most muted after 15 minutes on the table as the aromatics express rapidly, but seem to diminish just as quickly. It, likewise, brings a characteristic Dunham funk quality that I find both appealing and evidence of a brewing maturity. In the mouth, I get a slightly tannic quality with a low level of spicy phenols complemented by what I imagine are the fruity elements of sea buckthorn - not that I have ever tasted it outside of a beer - before a nicely dry finish with a moderate (and I'd say perfect) level of tartness. Oddly, though I wouldn't call the tannins high, they stand out despite this beer following my tasting of VVV above. 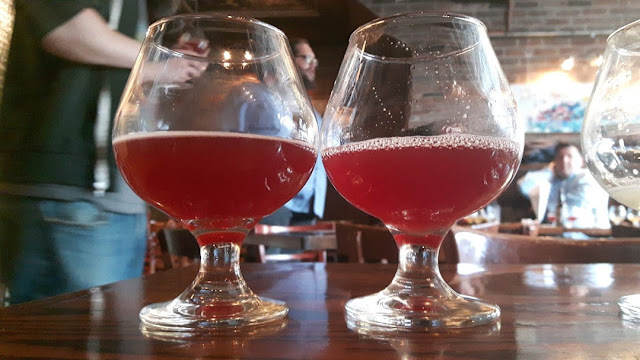 Carbonation is moderate, but should still be picking up a bit, and though it smells bolder than it tastes, it is delectably dry, tart, and crushable now with the promise of increasing funk over time. This batch of Dunham's barrel-aged dry-hopped sour is a treat once again! Unlike the original Oro Zuur (with Mosaic), this is less sour overall, but perhaps more funky on the nose. The nose here has a deep level of the noted characteristic funk complemented minimally by some berry and tropical fruit-forward hops. Unlike some dry-hopped sours that are full of (clean) fruit without funk, this is more funk with a hint of fruit. There is a trace of wood underneath, but it is aromatically dominated by something like musty sour fruity candies. 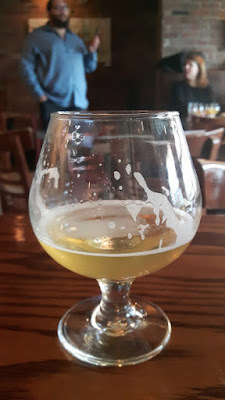 Tastewise, it is much more muted up front than past versions but ends with a musty, mildly tart, quenching signature that is evident in many of these beers, and it is very, very enjoyable. The beginning here is a bit fruitier than in other elements, where mild strawberries and shades of lemon zest come to mind. The carbonation and feel are both moderate, to moderately full, but somehow the dryness and finish (not to mention delightful flavours) still invite drinking over sipping! I don't find the differences between batches of Oro Zuur to be too large, but I do believe I slightly prefer this more funky version to the more sour versions that preceded it. Regardless, I can't see anyone who enjoyed the others being turned off here as the strengths all remain, if in slightly different proportions. Dunham's Berliners just keep getting better and better! This latest incarnation presents a gorgeous pink hue, with a head that lingers and laces despite the bolder carbonation of the style. Aromatically, it is milder than expected, but still offers a pleasing nose characterized by the dragon fruit. It doesn't smell very sour, as a kind of floral and fruity quality takes over. Though I am unfamiliar with dragon fruit, I would say it comes a bit close to kiwi in my assessment of the nose. Again, being unfamiliar with the base fruit, I'll also add that I get something on the nose that smells almost artificial, but not in a bad way. Though it doesn't smell at all like cherries, I mean artificial in the way that maraschino cherries smell a bit different than unaltered fruit. This isn't off-putting in the least, rather it is simply descriptive of something I lack the language precision to otherwise explain. Tastewise, this offers a massive fruity character up front before evolving with a decent acidity and dryness that spreads across the palate. The carbonation is bold, as it should be, but somehow there is an oilyness to the feel that works excellently as it seems to stick the beer against my entire mouth forcing a linger of fruit and moderate acidity as I swallow. Somehow, this just works perfectly with this beer! Oddly, despite an actual final pH of 2.86, this beer doesn't feel that sour in perceived acidity, and it remains super crushable and refreshing! This may have been my favourite sample of the evening! This gorgeous beer (pictured above beside its Tokai barrel counterpart) is super fruit-forward, with the nose offering that bitter-sweet currant aroma alongside a fair bit of alcoholic heat. As it warms, there is a very, very faint trace of what I identify as fusels, though I am told it is likely the fruit (but I am sceptical - see the Tokai review below). Though it smells quite hot, you cannot taste the booze at all, as the currants dominate in the mouth. Less tart and less acidic than past versions, but the fruitiness complements this moderately low sourness with a full body that creates an excellent sipping treat. I would imagine this too shall still carb up some, but even if it doesn't, the body is truly juicy making for an excellent refreshment nonetheless! Okay, hate is a strong word, but this had off-putting qualities to me. WARNING: do not read below if you don't want to have this and a few others beer ruined for you by the power of aroma suggestion! First, it has fusel components. Again, I am told it isn't fusels, but I taste them as well and I have come to be accustomed to these in a few failed homebrews that got too hot in primary. Representatives from the brewery insist it may have been a by-product of the fermented fruit, but I do not get this from any other version of this product and there were even more heavily fruited versions in the past. Second, there is an expression - perhaps from the fruit as from the flowers in Cantillon's Mamouche - that comes across as insect repellent to me. Once, at a Cantillon tasting, someone pointed this out and everyone else present wound up able to smell nothing else after, and now I am unable to not notice it whenever I smell Mamouche. I am sorry if my description does this for you, but despite my general love of tokai barrels and of other variants of this beer I cannot help but be disappointed in whatever happened to this product. Do let me know if you agree once you smell and taste it. 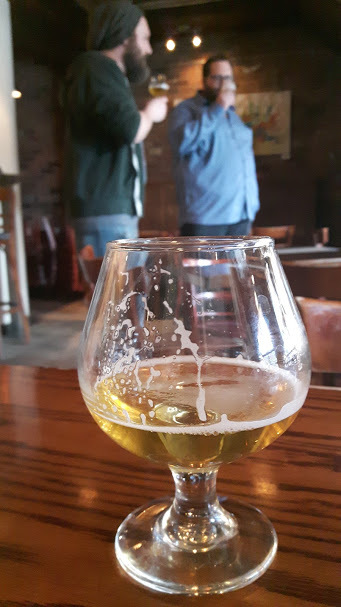 That said, the yeast and bacteria in this beer could continue to transform it, and I'd be excited if they did so, but as it stands, this beer wasn't for me. Regardless, as noted, Dunham continues to innovate and their experiments are almost entirely successful, this time no less than always! Despite my dislike of one beer, I remain enthralled by the others such that you know where to find me on May 13!